I use digital tools to tell the stories of people doing great work; and I help others to tell their own stories. It provides context for people to develop new or changing opinions. The organisations that people trust are those that they know and have on-going relationships with. This further applies to individuals. The way they develop these relationships is by connecting with their stories. I help people tell their stories, through online video and other forms of social media. Every day there are people and organisations doing great work whose stories never see the light of day. This leaves the way open for the media to distort people’s perceptions through TV programmes such as “Benefits Street” and the like. People and organisations telling their stories is thus vital to counter this picture. I believe we all have a duty to try to make the world a better place. That’s what I try to do every day. I love the internet and all kinds of new technologies; I am amazed by their potential to improve people’s lives and I want to pass on the passion I feel for these things to everyone I meet. I help businesses, public and voluntary organisations to use social media to improve the way they communicate with their customers, constituents and supporters. 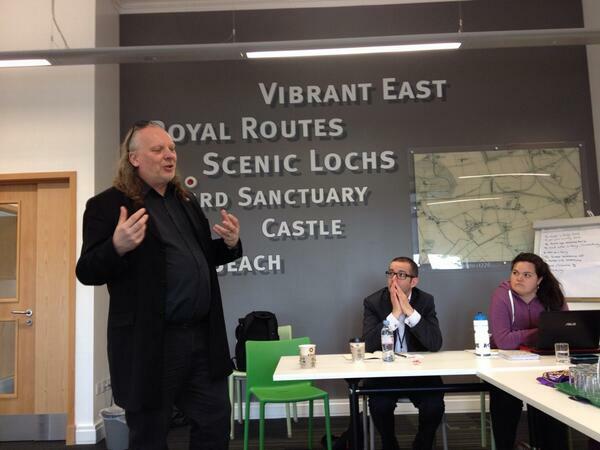 I am a social reporter, helping events and organisations communicate their activities to the world, and I am a founder of the Huddersfield Social Media Cafe and a co-facilitator of #lgovsm, the weekly twitter chat about local government and social media. I promote and facilitate the application of modern technologies and social media to society’s issues and problems. 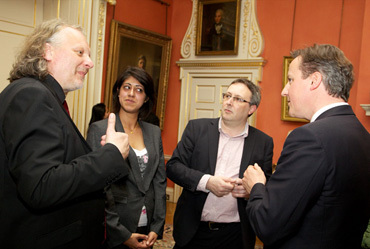 I was one of 3 people who were the first visitors ever to be allowed to use social media from within 10 Downing Street. I am experienced in social reporting, including aiding local communities to tell their stories through local websites, youtube channels, and event reporting. I do reporting of events myself, including live blogging, live video-streaming, vox pop interviews, photography, and audio recording. You can find out more about my work portfolio here. I was born and spent much of my earlier life in Nottingham, and went to university in Durham. I have lived and worked in the West Midlands, and now live in Huddersfield, West Yorkshire. I am a long-distance, mainly absentee, supporter of Notts County Football Club, avid follower of the England cricket team, and lover of what they call “classic rock” music, particularly Rush and Magnum. Its fine if you have nothing to do. People who work are already multi-tasking without this added burden. Really interesting posts on your blog (even if they are your own views) 😉 There is a lot of food for thought and you are one of those people who care and are totally involved in what you do. Keep doing what you do, it makes a difference. John – sent you a note on Twitter then realised you’re not following me, so apologies for taken this route! Saw your tweet re: “Maid in heaven”, if you want a copy of Bill Nelson’s finest 2 mins and 29 seconds then drop me a line. My band supported Magnum many years ago at Retford Porterhouse. The guitarist lookd like the lion out of the Wizard of Oz. They were lovely people. I had forgotten all about it until I came here. This is the most amazin of times to live in…. the things that we’ll collectively be able to achieve will be amazin…. the best of us, and by ‘us’ I mean anyone that ticks the boxes 1. human, 2.pulse, will be read about in the years to come. The opportunities for this change are in the hands of the individuals, who will be empowered, the ‘system’ is changing and therefore very exciting to many. Very scary for an awful lot of people too. I find the most difficult things are the most rewarding, The project, which I’m hoping it’s one of the things we have common ground, has been aimed to opperate in this new climate of change. The fun I have in overcomming the obsticles in the way, the amount of people who’ve for some reason have underestimated my talents, all my peers in business are fascinated by my project, nearly all agree that it’ll be impossible to do. It’s spurred me on because I can see a way to achieving my goals. I hope you’re on board, if you’re not, there’ll be no exemption in the future. remember, 1. human, 2. pulse, The level of trust may be different, but thats in your hands. I want people around me who believe…. Will hook up with you on Twitter. Pingback: Final 5% or Final 10% - what's the difference?